How important the time is in trading? Let me show you two trades that I took recently to give you an answer to the question whether the time is important in trading or not? First, I would like to show you a trade that I took in today’s Asian session. It is a perfect demonstration of how good memory markets have. My short trade was on the USD/JPY and it was based on the “Trend Setup“. After the level got created, the price went downwards and it took three weeks for the price to come back to the level. Even though the level was just an intraday level and it was three weeks old, the market clearly knew about this level and there was a strong and clear reaction to it. 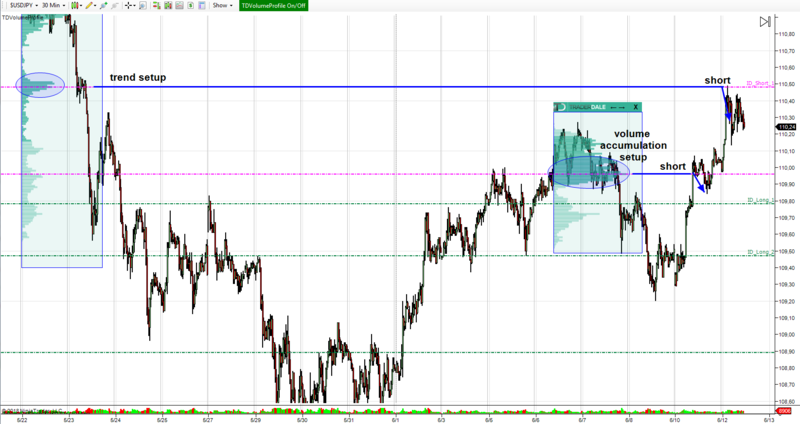 Another short trade that I took on the USD/JPY was yesterday. It was based on “Volume accumulation setup“. This trade was quite nerve-wracking because it took over 7 hours to hit my 10 pip Profit Target. For me, time isn’t that important so I held the trade until the end. The level was also pretty strong (look at the heavy volumes! ), so I was pretty sure there would be at least some reaction. It would be pretty weird if the price just went through such a strong area. As you can see the waiting has paid off in the end and despite a long rotation above my level. I took +10 pips profit after more than 7 hours of waiting. As you can see from these two trade examples, time is not really that important in trading. Thank you for explaining the tool. Thing is, I use NT7.0. I believe this tool was made for NT7? yes it is made for NT7. We are currently working on NT8 version. We need to make the thing basically from scratch again. Everybody who purchased the NT7 version will get the NT8 for free. I pay for the development myself – it will be sort of a gift for you guys.